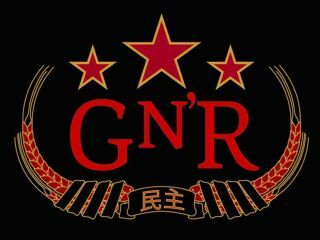 Hot on the heels of yesterday's Swedish Chinese Democracy love-in comes another chance to hear GN'R's latest before anyone else. The band want fans to upload an "inappropriate air guitar" video to YouTube - the best gets to take 100 friends (yes, 100) to the UK's exclusive Chinese Democracy listening party. Now, many of us boast a few hundred Facebook friends, but trying to find 100 'real' friends who might enjoy head-banging the night away to unheard Guns N' Roses material could be a struggle. Regardless, the party takes place in the winner's home town who'll also receive a platinum disc version of Chinese Democracy (the first in the UK). To stand a chance, dust off your air guitar-chops and head over to YouTube before 17 November.